You may have to put your foot down today and be stern with someone that you’ve let slide in the past. Alternately you may be on the receiving end of someone else’s objective and impartial sense of discipline. As with all court cards this can also refer to you — or to a state of mind that you need to develop — in order to preserve a sense of order in your life. 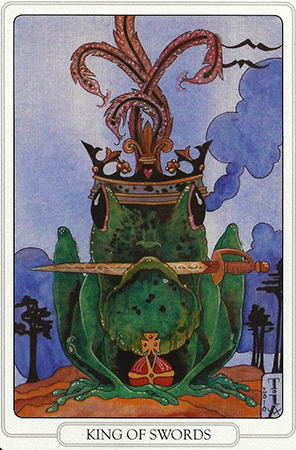 You may have felt taken advantage of by someone who has overstepped their bounds with you and this card encourages you to resolve that problem by taking a more authoritative stance. This “King’s” stern and grumpy demeanor is somewhat caricaturized in this version of the card. But the King of Swords is also highly intelligent, strategic and analytical. He’s most importantly impartial. He doesn’t mince words, and he doesn’t listen to excuses. He makes his decisions based on logic and reason rather than compassion and empathy. This card can refer to a need for justice and symmetry in your life. Or it can mark the presence of someone whose sense of authority and justice overrides personal investments. Whether this refers to you or to another, the underlying message is the same. Step away from emotional attachments and make your decisions today based on what is right, fair, and most importantly best for you in the long run. The deck used for today’s tarot scope is the featuring the Tarot of the Tattoo Age by Flaco Productions. The cards in this deck were each designed by a different artist. The Six of Swords was designed by Chris Howell.